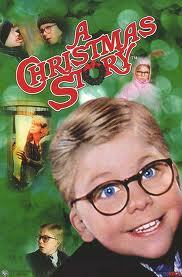 As long as I can remember, "A Christmas Story" has been part of my family's holiday celebrations. As a child, I'm not sure I appreciated the witty and hilariosity of it all. We'd all gather and my grandparents' house in Lorain, Ohio for a grand family dinner and Christmas Eve present opening. Seems I recall, however, that the sound of this particular movie could sometimes be heard wafting in from the country kitchen. As time wore on, we transferred our gatherings to my aunt and uncle's house in Amherst. I can, clear as day, see my uncle sitting on the couch, mesmerized with the TV. If I heard bellowing laughter in the house, I knew it was my uncle and I knew this movie was playing. If I heard a more high-pitched cackling, I knew it was my mother, and I know the "show me how the piggies eat" part was on. Last year, there was a little war amongst the youngins. I could tell whose parents had been raising them right because they were the ones arguing that the TV be left on "A Christmas Story." The others were all about a repeat episode of "Iron Chef." Blah. I think I just let them have at it and fell asleep next to my dad. Since I've been on my own, I watch this movie as party of my holiday celebrations, but in recent years have made a formal event out of it. This past Saturday I had my 4th annual "A Christmas Story" party, and, dare I say, the best one yet. My awesome friend Dallas, equipped with a theater and an amazing living situation, agreed to co-host. 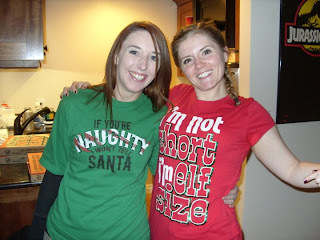 We had more treats than Santa himself could ever care for and pizza and people everywhere. I cannot describe this feeling of warmth that rushes all through me when I hear a room full of my friends or family laughing. I can't say enough how blessed I am!